I received a speeding ticket last night from the OPP (stationary OPP 4x4 on side of highway using radar) where I was clocked @ 134kph. 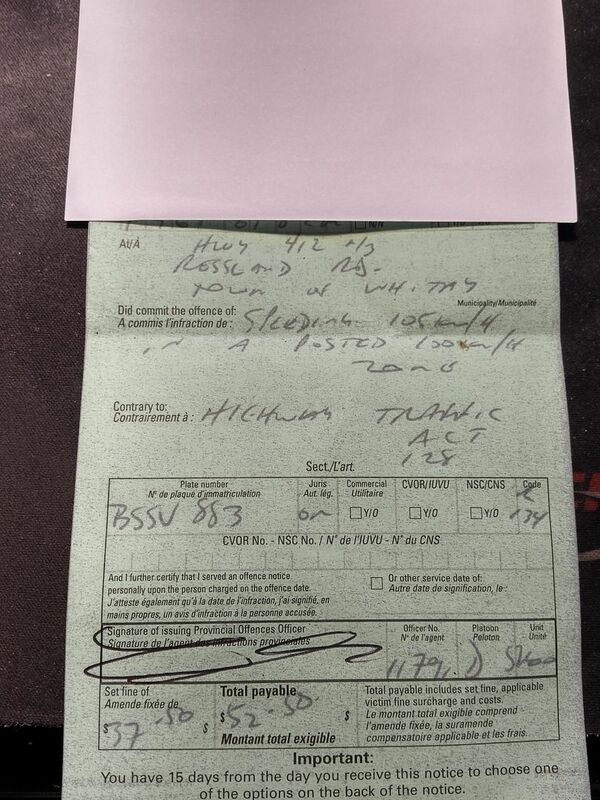 The ticket indicates that I was going 105 in 100kph zone (cop meant to drop to 15 over; not 5 over), but the fine indicated on ticket is for 15kph over. The ticket does indicate that the ticket was reduced from 134. So he question is... Is the fact that the speed over and associated fine not matching be enough to void the ticket? If I fight it, will/can they go after me for the original 134kph? Any advice would be appreciated!! Thanks! Post a picture of a ticket. If indeed a the speed says 105 and the fine is incorrect, I believe this will be a fatal error. Post a picture and we can help more. Yep this looks like a classic fatal error scenario. The best thing to do in this situation is ignore the ticket and wait to see if it gets quashed. If it doesn't then you can appeal citing the London v Young case. daggx wrote: Yep this looks like a classic fatal error scenario. The best thing to do in this situation is ignore the ticket and wait to see if it gets quashed. If it doesn't then you can appeal citing the London v Young case. Hi. So the ticket was not quashed. I have received a Notice of Fine/conviction. What's next? How do I appeal the ruling? Any further details on the London vs Young case? A recent Ontario Court of Appeal decision allows officers to amend a Certificate of Offence after the Offence Notice has been served. Your Offence Notice may not have a fatal flaw. The only way to find out would be to file an appeal with the court.